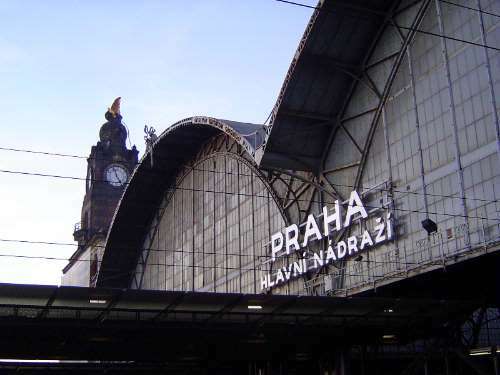 With the disappearance of the Iron Curtain, Prague stepped out of the gray shadows. What did newcomers see? 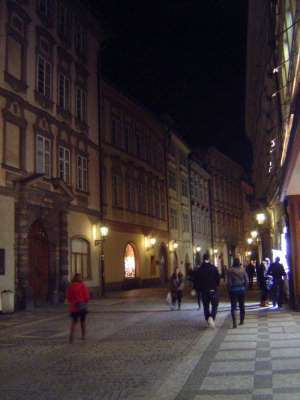 That street is the pedestrianized Celetna Ulice, carefully (which means not excessively) lit. 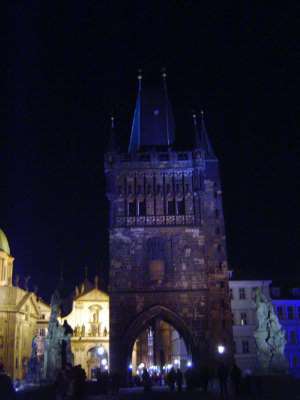 Just before coming to the square, pedestrians can hardly miss the towers of Our Lady Before Tyn, a church completed about 1450. 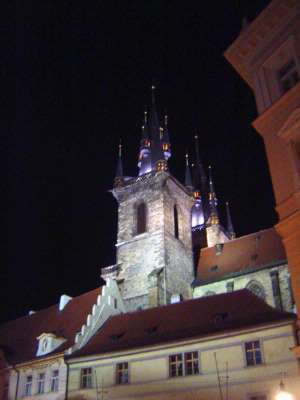 Here it looks like Disneyland's Sleeping Beauty Castle, but on the spot it's arresting. 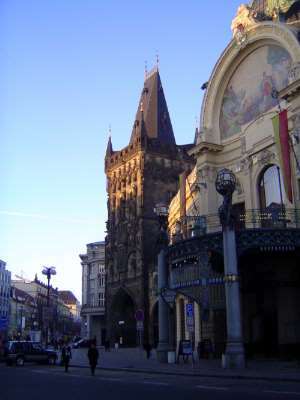 The main facade of the church is oddly obscured by the Tyn School, opened in 1550 and with arched, stepped gables cheerfully incongruous with the Gothic towers behind them. 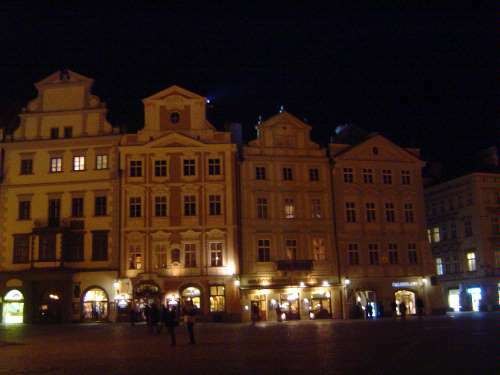 The church faces the town square, or Velke Namesti, as do these houses with Renaissance facades. 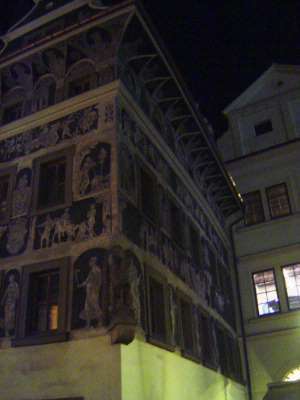 The houses often have names: the one on the far left, from 1520, is the House of the Stone Lamb. 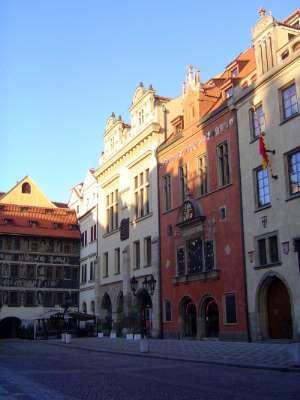 Directly opposite the church is the old city hall. 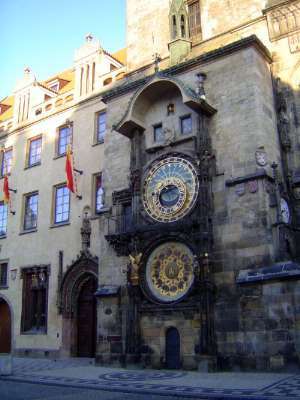 On the side of the old city hall there is a 15th century astronomical clock, showing the time, date, and more. 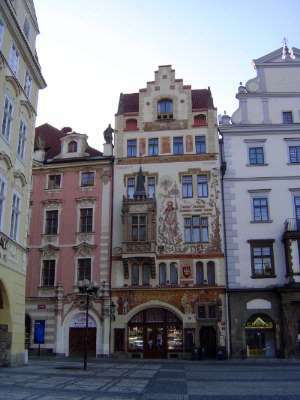 There are several choices of pathway from here, but the path to the river leads to this, The House at the Minute, from 1610, with sgraffiti portraying rulers and figures from mythology and the Bible. 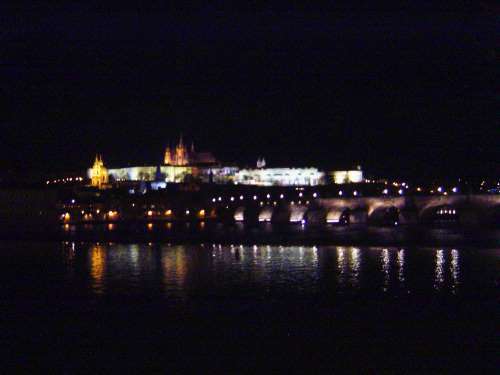 The river historically was fordable but is crossed here now by the Charles Bridge, or Karlov Most. 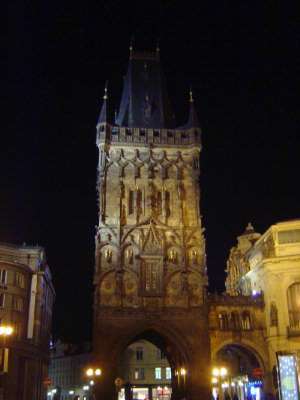 Anyone entering the city from the bridge passes under this tower, built in the 1230s and a remnant of the city's wall. 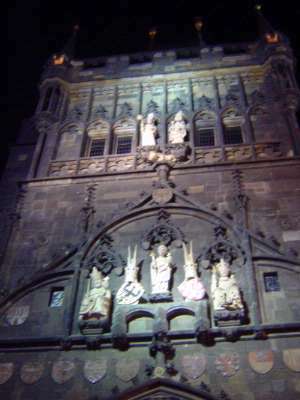 The tower has images of Emperor Charles IV and King Vaclav IV. 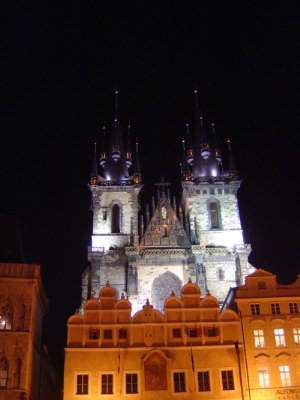 The baroque Church of St. Salvator, from 1660, is one of the few spots where the lighting experts have gone overboard. 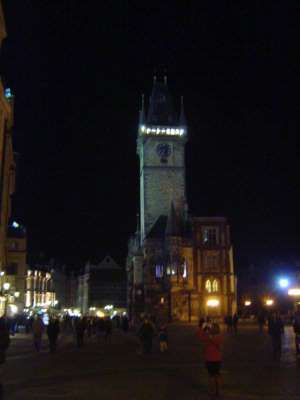 In the light of day, the Town Hall and Powder Yower lose a bit but not all of their charisma. 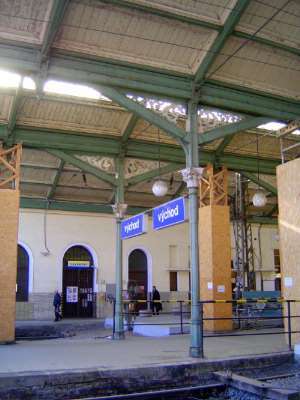 The facade bent to fit the site. 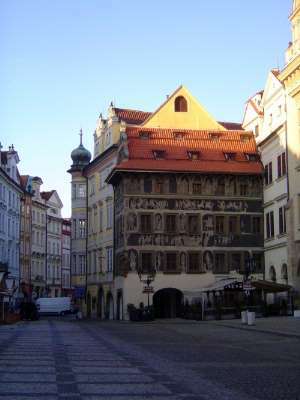 The mosaic is Hommage a Prague, by Karel Spillar. In the morning, Celetna Ulice seems more prosaic. 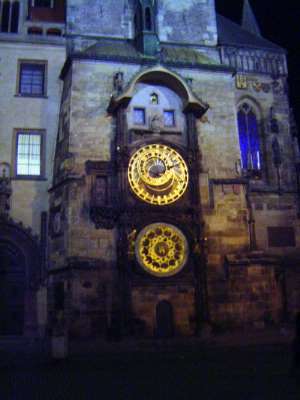 The House of the Minute, Dum U Minuty. 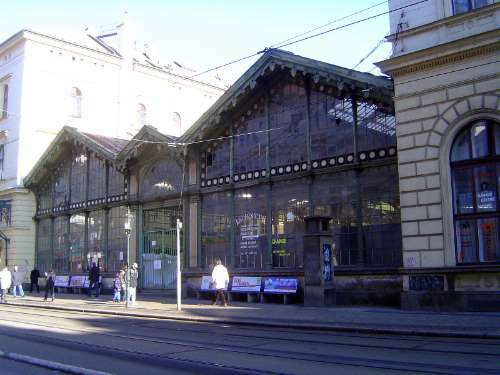 The name has nothing to do with time but with the tiny bits of tobacco once sold here. 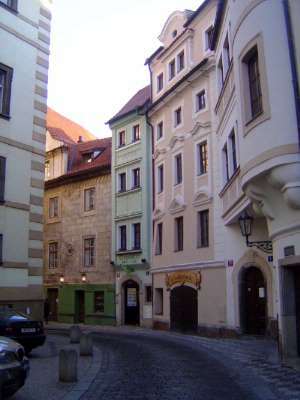 The building is said also to have been a childhood home of Franz Kafka. La table de pierre, or U kamenneho stolu. 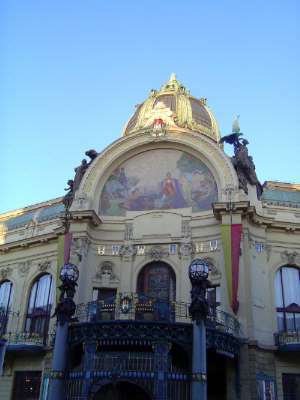 Paintings by Ladislav Novak and Arnot Hofbauer, following sketches by Mikolas Ales, decorate a building from 1896-97. 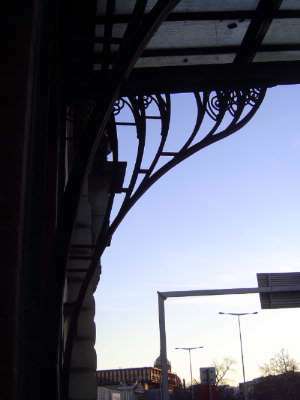 The architect was Eduard Rechziegel. And so neighborhoods like this along the river have survived. 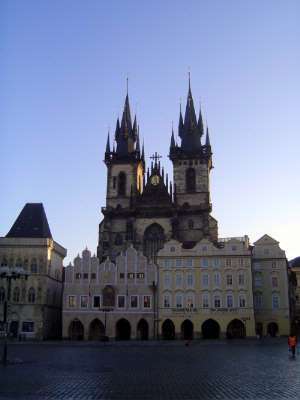 Across the river, St. Vitus Cathedral, within Prague Castle, rises in the morning light. 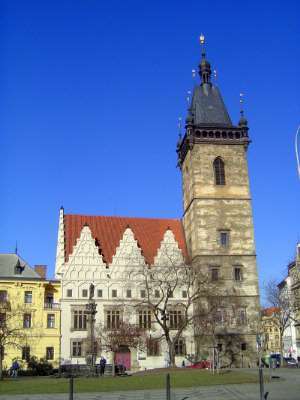 The Novometska Radnice or New City Town Hall was built in the 15th century, modified in 1806, but restored to its Gothic roots when it was modified again in 1905. 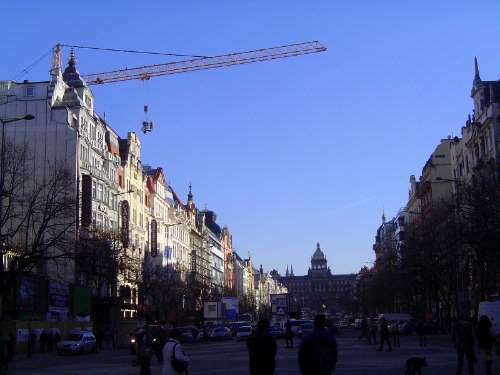 New forms did take shape in the city, however. 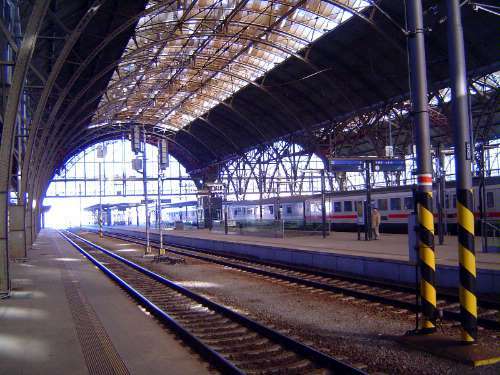 Here, a trainshed. 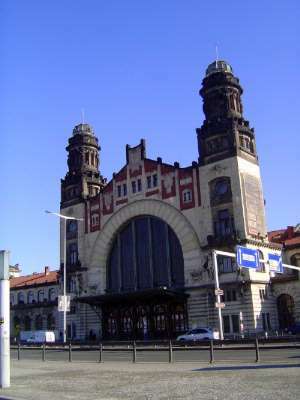 And here the much grander Wilson Train Station, designed by Josef Fanta and completed in 1909. 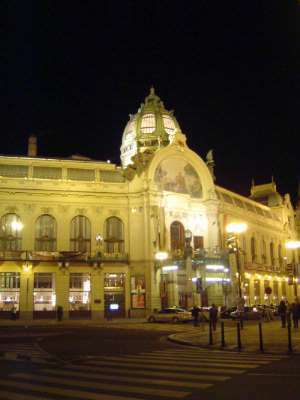 It's described as the most important Secession building in the city. Residential neighborhoods changed, too. 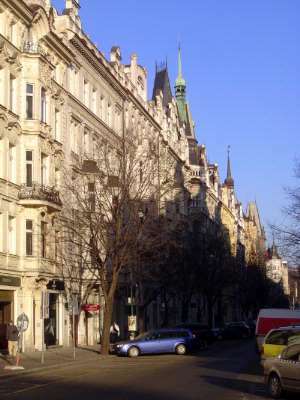 Parizska Ave, inspired by Haussmann's Paris, was developed between 1895 and 1910 in accordance with a plan from 1893 to connect the historical center with a bridge leading to garden suburbs. 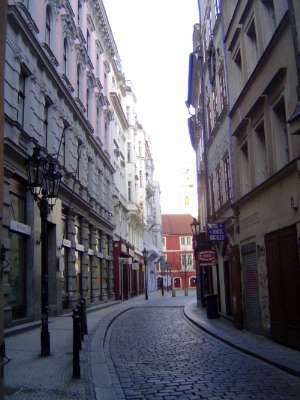 Vaclavske Namesti runs through the New Town, established despite its name a very long time ago, in 1348. 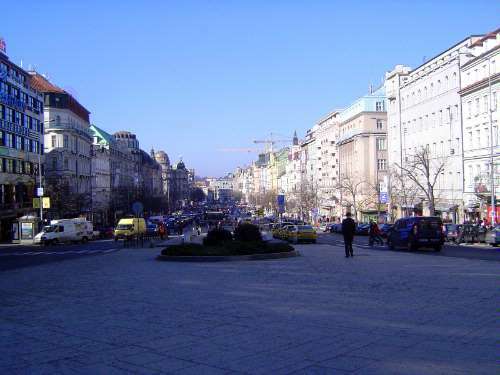 The streets here are gridded. 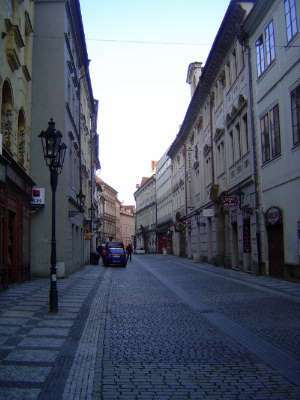 Looking back the other way on the same street, which ends at the National Museum. Yes, a man is riding alongside the concrete bucket. 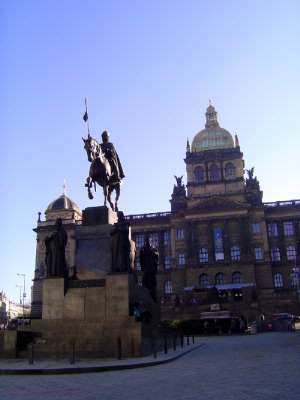 The national museum, or Narodmi Muzeumat, stands atop Wenceslas Square at the head of Vaclavske Namesti. 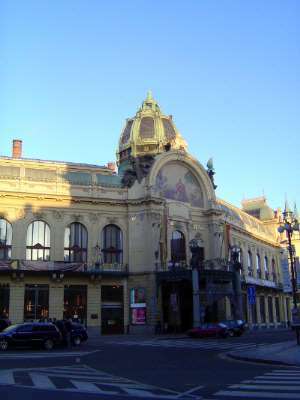 The architect was Josef Schulz. 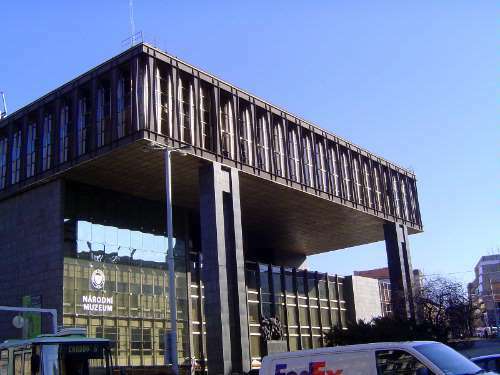 The museum's new wing, by Karel Prager and others, 1967-1973, was built as the federal parliament. 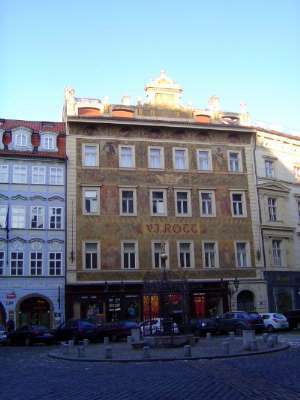 It later was the home of Radio Free Europe.